Lifer Great Plains Toad found along the U.S. - Mexico border in Arizona. Great Plains Toad from southern Arizona. Heavy rain in southern Arizona. Beautifully patterned Great Plains Toad from New Mexico. High-green Great Plains Toad from North Dakota. Great Plains Toad breeding habitat in North Dakota. Side-by-side comparison of Great Plains Toad variation from a single Minnesota wetland. In search of a mate in Minnesota. Group of herpers targeting A. cognatus during the 2014 Minnesota Herpetological Society field survey; a lifer for several. The Great Plains Toad (Anaxyrus cognatus) is one of three toads native to Minnesota. It is the rarest of the three, and is restricted to western and south-central Minnesota. This species was recently listed as Special Concern by Minnesota Dept. of Natural Resources (MNDNR, 2013), and more information about its biology, conservation concerns, etc. will be available on the DNR's Rare Species Guide webpage in the near future. Figure 1. Great Plains Toad (Anaxyrus cognatus) distribution based on observations submitted to HerpMapper.org. Add your observations to help fill in data gaps. Hex Map provided by HerpMapper.org. The Great Plains Toad is a wide-ranging species found primarily in the arid west and grasslands of the north-central states (Fig. 1). It reaches the eastern edge of its range in the tallgrass prairies of Minnesota and Missouri. It is an explosive breeder following heavy rains, and prefers to breed in shallow temporary wetlands (fishless). In Minnesota and North Dakota, breeding typically occurs in late May or June (personal observation). It overwinters on land, but is freeze intolerant (Swanson et al., 1996). To avoid freezing temperatures, toads use their strong hind limbs to dig below the frost line. In the northern portions of their range, this may mean toads dig down 10 ft ( 3 m) or more. Apparently secure across portions of its range (IUCN, 2015), it is a species of conservation concern at range edges. It is listed as Special Concern by the Committee on the Status of Endangered Wildlife in Canada (COSEWIC, 2010), and assigned a S2-S3 rank in a few U.S. states (NatureServe, 2015). Loss of breeding habitat is the primary conservation concern for this species. Increases in the installation of drain tiling in agricultural areas completely eliminates some breeding areas, and significantly reduces hydro-period in others leaving eggs and tadpoles to dry up and die before metamorphosis is complete. In Minnesota, the installation of drain tiling has increased exponentially in recent years. Unlike Minnesota's other toads which have a high-pitched musical trill, the Great Plains Toad has a loud mechanical trill, some even consider it an obnoxious call. Hearing protection is recommended when standing in the midst of a large group of Great Plains Toads. Desert rain at dusk. Chasing Great Plains Toads in southern Arizona's beautiful landscapes. It was a warm rainy night when I encountered my first Great Plains Toad. It was observed hopping across a road near the U.S. - Mexico border just as the evening's rain began. As the rain continued into the night, hundreds appeared along Arizona roadways along with Couch's and New Mexico spadefoot toads (HM 1637 and HM 1636 respectively). Along a relatively short stretch of road, Western Green Toads also appeared in good numbers (HM 1638). Since my initial encounter in Arizona, I have observed this species during subsequent trips to Arizona, as well as in Minnesota, New Mexico, and North Dakota. If you find Great Plains Toads while out and about, be sure to document your find at HerpMapper.org. 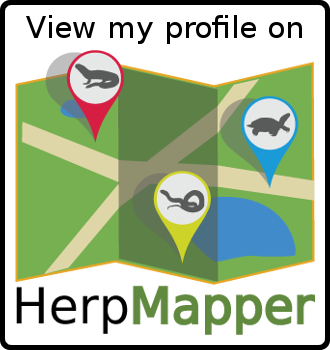 HerpMapper is a global citizen-science project designed to gather and share information about reptile and amphibian observations across the planet.